Discover everything around the mysterious nature of the wide variety of Spanish Fiestas, a world of sun and celebration that you will want to live in your own skin! If there is a thing that defines the way of life and the Spanish mentality is the disposition of the Spaniards to Spanish Fiesta. The Fiesta is an event that works both as a liberation and as a social engine, since it gives a meaning to the tradition and history of each specific town, and thus, to the whole of the Spanish society and its culture. 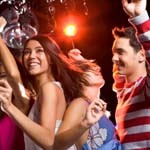 Therefore, getting to know the most typical and internationally acclaimed Spanish fiestas is a perfect way to dive into Spanish culture and way of life. There are two main types of fiestas in Spain. Depending on the origin of the celebration, they can be either pagan or religious. Pagan celebrations are usually related to the agricultural and farming world, and are associated with the end of specific labours, as is the harvest or the vintage. The Tomatina of Buñol, or the Bando de la Huerta in Murcia are perfect examples of these kind of fiesta, oriented towards a thanksgiving feast for nature and its generosity. Other forms of more modern pagan celebrations include events like the different versions of the Carnival in cities like Tenerife or Cádiz, the Castells in the Barcelona and Cataluña area, or the Tamborrada in San Sebastián. Religious celebrations are the main chapter in Spanish fiesta, due to the country’s strong catholic tradition, and are usually lush in art forms and imagery, impressing on the visitor’s mind a very rare and unique stamp of Spanish tradition and culture. 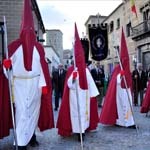 The Easter (Semana Santa) processions, celebrated throughout the geography of Spain, are the most representative example of this kind of event. The faith and passion with which some of the locals live these festivities in cities like Sevilla or Málaga also adds an emotional component into the equation, which only come to emphasize the strong social and cultural bonds that Fiesta have deep down in the Spanish culture. There is also a mixed type of celebrations, in which either a pagan tradition is picked up and reformulated through a religious optic, as the Hogueras in Alicante, or where an originally cult-related festivity has lost the religious envelope and has turned into a big social event, as would be the Fallas in Valencia or the worldwide famous running of the bulls in Pamplona’s San Fermin. Although these feasts originally celebrated a saint or a cult remembrance, the religious aspect has been progressively blurred, giving way to a more Dionysian popular celebration. May this article be a guide through some of the most representative Spanish Fiestas, still the best way of getting to know them better and to experience Spanish culture in its whole would be to travel around Spain. You won’t ever forget the enriching experiences you’ll be able to live while you enjoy learning a new language and understanding a different culture. As in any other culture, celebrations are a basic form of social and cultural integration, and serve as a relief for the daily struggles, opening a time of joy and carelessness, and are a mirror of the tradition and a lever for it to pass onto the younger generations. They are also a means for sharing, for strengthening the community’s bonds through its history and tradition and -of course- for having fun. Due to Spain’s unique geography and exceptional weather, the outdoors element of the fiesta is a basic one. People gather on the streets to celebrate, eat, drink and dance, accompanied by a nice warm weather that can be enjoyed almost anytime from the spring to the fall. And since most of these fiestas take place during the summertime, it wouldn’t be a bad idea either to spend a summer in Spain, too! Also, the wine culture in Spain and the quality of Spanish food have generated their own form of tourism, which can be perfectly combined with a tour around the most notable Spanish Fiestas, turning your visit into a feast for the senses. These elements, together with the liveliness of its people, make of Spain a delightful destination in which tradition and modernity converge to create a unique travel experience.